What is a Trex composite deck? Instead of a traditional wood deck, Trex composite decks are made of a dual-layered system. The base layer is a durable piece of sustainably-sourced lumber: in other words, a board. But it’s the protective shell that is molded to the exterior surface of the board that sets Trex composite decks apart. This exterior shell comes in more than a dozen colors, each made to look like a different strain of wood. The board-and-shell combination ensures that your deck is durable and splinter-free from day one. Trex makes it a point to use only sustainable sources in their composite decking. In fact, 95% of the materials in Trex decking are recycled. The board and shell use a combination of recycled lumber, sawdust, and plastic film to produce the durable, beautiful results. In other words, Trex is green from the word go. Why Trex Over PVC decking? Trex provides superior protection from mold, mildew, and warping. PVC, on the other hand, is a type of plastic; when exposed to long periods of sun and extremes of temperature, even the best-quality PVC can warp. PVC also does not breathe as well as composite lumber. This means that if the PVC cracks and moistures penetrates into the PVC, mold and mildew can set in. This will only speed up the degradation process of a PVC deck. So, because of the enhanced protection provided by Trex’s patented shell system, Trex is definitely better than PVC or other decking materials. Why Use Trex Composite Decking Instead of Wood? A trex deck is different from a traditional wood deck. For one thing, the shell provides superior protection for an extended life of your entire deck. The shell prevents cracking, warping, splitting, and rotting. Nothing can penetrate your new deck – not termites, mold, or mildew. Your deck won’t fade or stain, and you don’t have to buy any expensive cleaning products; simple soap and water does the trick every time! 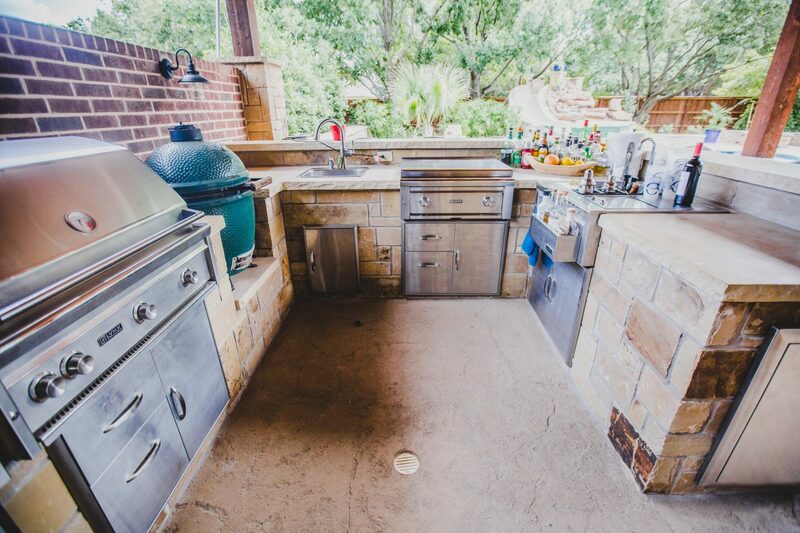 Some of the Trex product lines offer a 25-year warranty. Yes, you heard that right – 25 years of perfect deck, so your family can enjoy it in as many ways as possible! There are three full lines of composite decking that we offer: TrexSelect, TrexEnhance, and TrexTranscend. 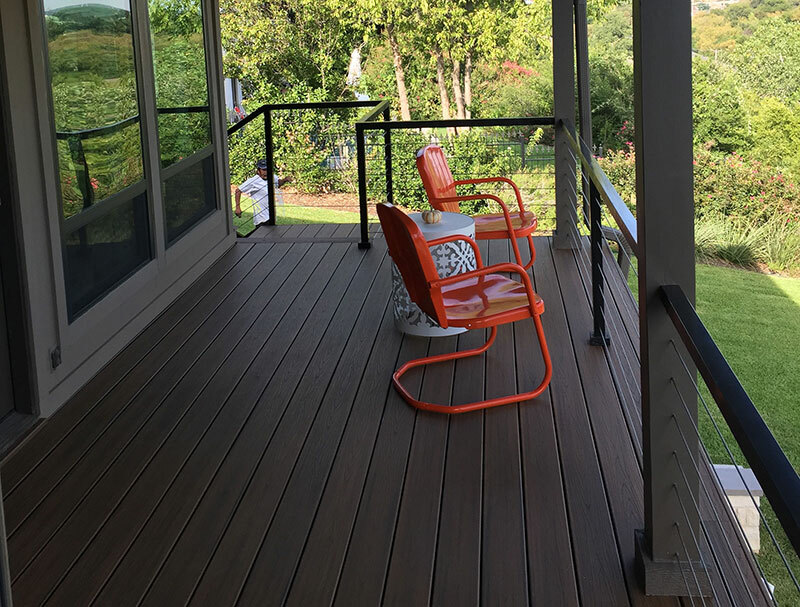 Each line comes in multiple colors for your customization; in addition to our composite decking boards, Trex railings are available to match most every style of Trex decks. Whether you choose aluminum or composite, your family and guests will love the completed, elegant look of the railing when paired with the deck. If you are interesting in installing a Trex Deck Product, we would love help. Give us a call today, so we can start building the backyard of your dreams!